May 23, 2012, 44 years after the first strike by Chicago teachers, on Adams St. in Chicago Illinois, Chicago Teachers Union President Karen Lewis led a march of 10,000 people, most of them CTU members, through Chicago's Loop following rallies at the Auditorium Theatre and in Grant Park against the policies of the Chicago Board of Education. Lewis can be seen in the above photograph with the Rev. Jesse Jackson Jr., American Federation of Teachers (AFT) President Randi Wingarten. and Illinois Federation of Teachers (IFT) President Dan Montgomery leading the march, which stretched for more than five blocks as it worked its way from Michigan Ave. to its end point on LaSalle St. Substance photo by Sharon Schmidt.The video features six veteran Chicago Teachers Union members (including this reporter) who discuss the history of the strikes between 1968 (the famous FTB strike against racism and segregation) and 1987 (the 19-day strike) that made the Chicago Teachers Union the most famous militant union in the USA. 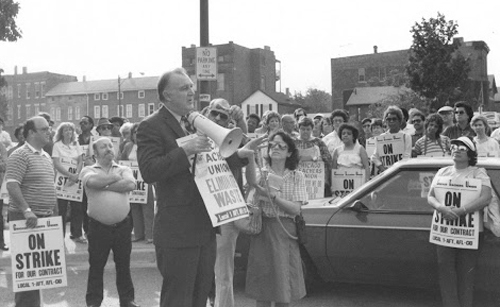 As the video points out for historical accuracy, CTU continued to strike successfully even after "PATCO" supposedly made the labor movement afraid to strike. The video was produced during the summer of 2012 as the union busting tactics of the Chicago Board of Education and the administration of Chicago Mayor Rahm Emanuel made it clear to more and more teachers that the CTU was being forced into the position of "Strike or Surrender" that it had faced during the earliest days of collective bargaining in the 1960s, and that many of the issues, including the tactics of the city and the Board of Education, had not changed in 50 years. In the introduction to the video, George Schmidt and Jim Daniels talk about the vicious racism that divided the City of Chicago through the 1960s and resulted in the majority of Black teachers in the city not only teaching in segregated schools, but unable to get "certified" because of a blatantly discriminatory oral certification exam. Members of CORE continued organizing and informing the CTU membership throughout the summer of 2012 as the strike loomed closer and closer. CORE leaders noted that a union that has forgotten its history is doomed to repeat the worst mistakes of its past, so CORE begin the long process of reviving the militant history of the Chicago Teachers Union in video and print.The segregation and racism were challenged both within the CTU and in the schools by a growing group of teachers, most of them Black, who eventually led a wildcat strike that shut down or disrupted more than 100 of the city's schools. The "FTB Strike" of 1968 is widely revered among progressive unionists in Chicago as a pivotal moment in the history of the CTU. As Jim Daniels notes in the video, the union leadership at that time declared the FTB strike against racist certifications an illegal "wildcat," but the leadership of that action eventually pushed the union into full integration and into overcoming the racism of the Board of Education's certification and assignment procedures. A trick used to keep minorities from becoming "fully certified" (and thus eligible for "assignment" as "regular teachers" and later, tenure) was the oral examination. Throughout the 1950s, as Chicago's enormous Black ghetto expanded across the South Side and the West Side through block busting and deliberate school overcrowding block by block, the Chicago Board of Education created more and more new Black schools, staffing them with Black teachers (and some whites, usually those considered "Hippies" and "Commies") who were forced for the most part to remain in "FTB" (Full Times Basis Substitute) status for years, or even decades. Ironically, however, the compression of the Black ghetto (which had been "allowed" to expand block by block thanks to edicts of the Chicago Real Estate Board beginning during the 1920s) also gave rise to a form of Black Power (in both the communities and the schools) unique in many ways in the USA. On result was the formation of "Concerned FTBs" (described in the video) and the formation of the Chicago Teachers Union Black Caucus (which for years led the American Federation of Teachers Black Caucus against the racism of the New York City schools and local). John Desmond, who served as President of the CTU during the 1960s and early 1970s, led the first two CTU strikes, in 1969 and 1971. He was later replaced by Robert M. Healey, whose "United Progressive Caucus" pulled together the major caucuses and factions in the union, including the powerful Black Caucus, into an integrated leadership that would lead the union through militant strikes and powerful contracts into the 1990s.The CTU threatened a strike in 1967 and as a result got its first written contract. 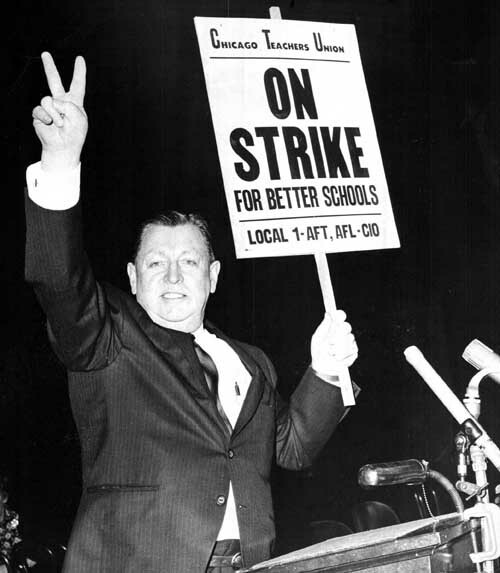 In 1968, the FTBs (Full Times Basis Substitutes) led the famous "wildcat" strike that helped force an end to the racist certification procedures at Chicago's public schools. Jim Daniels, a math teacher who was union delegate from Carver Area High School for decades. Terry Daniels, an English teacher who served as an associate union delegate from Carver Area High School for decades and is now a retired teacher delegate in the CTU House of Delegates. Howard Heath, a math teacher who served as an associate union delegate and delegate from Lane Technical High School for years and is now a retired teacher delegate in the CTU House of Delegates. Howard Heath served as Vice President of the CTU during the years (1981 - 1984) that Deborah Lynch was president of the union. Helen Ramirez Odell, a school nurse who served as a union delegate representing school nurses during her active duty years and is now a retired teacher delegate in the CTU House of Delegates. Helen also served for years as a leader of the women's rights movement and chair of the Women's Rights Committee of the CTU. Paul Odell, an elementary teacher who served as a union delegate from Black Magnet Elementary School for years and who later became a field rep at the CTU offices and helped coordinate citywide several of the most successful strikes of the 1970s and 1980s. George N. Schmidt, who served as delegate from several schools, including Tilden High School, Amundsen High School, and Bowen High School from the 1970s through the 1990s and is now a consultant for the Chicago Teachers Union and a retiree delegate to the CTU House of Delegates. George N. Schmidt, who organized S.U.B.S. (Substitutes United for Better Schools) and Substance during the late 1970s, and who served as CTU delegate at various schools including Tilden, Amundsen and Bowen high schools, as well as serving on the CTU executive board (high school functional vice president) twice. He currently works as a CTU consultant. 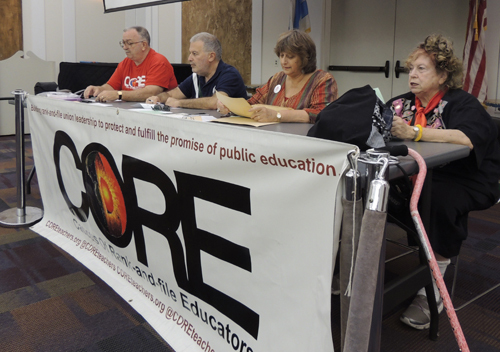 During the summer of 2012, CORE sponsored four forums featuring veteran CTU members who had helped organize and lead the strikes from the 1960s through 1987. Above, at the August 28 forum at the Sulzer library, are (left to right) George Schmidt, Jack Silver, Miriam Socoloff and Lotty Blumenthal. Substance photo by Scott Saffro.Chuck Wemstrom, who served as delegate from Hyde Park High School for years and is now retired and living his retirement in Western Illinois. The video is accompanied by vintage photographs from all of the Chicago strikes and an analysis of the historical context in Chicago — especially the massive segregation that made Chicago the most segregated city in the Northern Hemisphere — and how the Chicago Teachers Union became one of the centers of the still continuing fight against racism and racial segregaton in the nation's third largest school system, as part of the fight for better public schools for all urban children. The video tries to set a new narrative about the history of Chicago's public schools and how the Chicago Teachers Union, through militant direct action, including strikes, did more than any other institution in Chicago to improve the schools beginning in the 1960s. The narrative points out that through the 1970s, Chicago schools were built for black people and white people, increasing facilities costs enormously. The curriculum was based on a white supremacist view of reality, and discrimination against Black children and teachers was rampant. The Board of Education claimed that it had “standards” which required certification exams for teachers. Black people were unable to pass the standards exam because they were required to take the "oral examination" and were failed by the "Board of Examiners" as soon as they walked in the door. Jim Daniels discussed The FTB strike in 1968. "I was helping the FTBs at Carver High School organize for that strike," Jim aid, even though he was a certified teacher. "A large part of the problem was racism. After the first day, the union started issuing statements stating that it was not a legitimate strike, it was a wildcat strike, so after the second day the strike was called off at Carver. " Substitutes in those days could join the union only as associate members, Daniels noted. They had the right to pay dues, but not have representatioin. As as result of the FTB "wildcat" and other organizing, subs did get voting rights and got certified after three years of satisfactory teaching you became certified. Helen Ramirez Odell outlines how the union brought gains for nurses as well as other teachers. 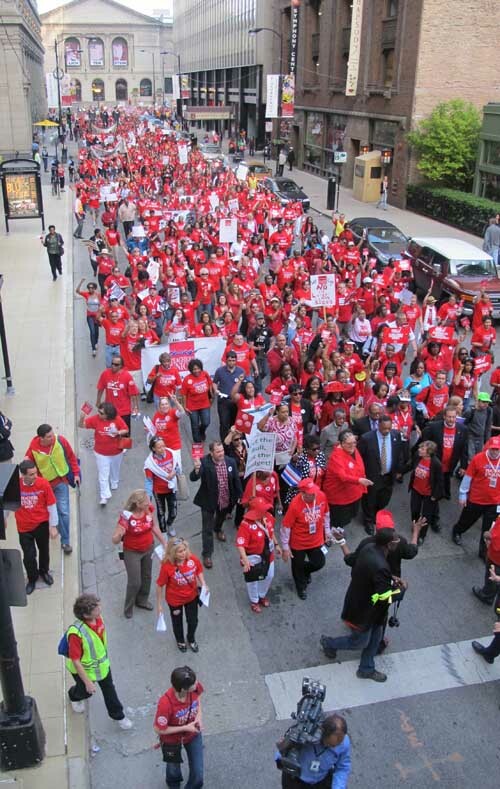 Almost all of the school nurses are members of Chicago Teachers Union. "Back in the 1960s, we had to decide wo we wanted to be our bargaining agent," she said, "and we chose the CTU." Howard Heath spent his entire career (except for three years as CTU vice president) teaching math at Lane Technical High School. "In the early 70s I thought the union at Lane Tech could bring some cohersiveness to a staff that was divided by race," he reports in the video. He noted an irony of the early union organizing, and the early strikes: "The shop teachers had been in unions outside of teaching were adament about union solidarity." The teachers went into the nuts and bolts of striking. Jim Daniels: "The first day of a strike is always optimism. We don’t think we’re going to be out long. After day after day after day, when the school board is digging its heels in, but with the support and with the loans the union would make, people were able to hold out. The union brought us closer together. I talked to people during the strike that I had never talked with before. We used the telephone then, versus what we had now. We had to actually get on the phone and talk." 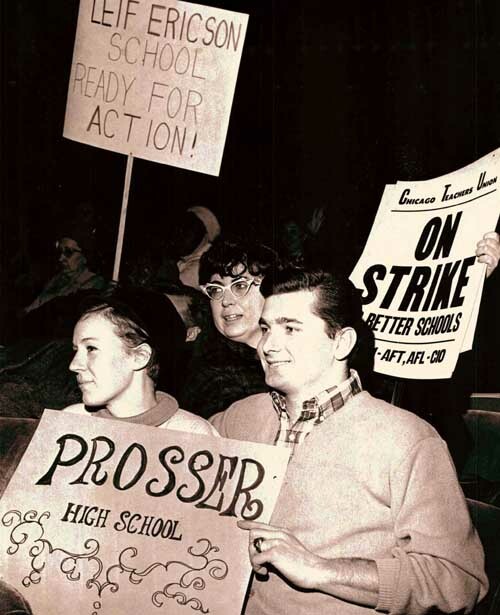 "In the earlier days we had to picket every school," George Schmidt reported. "The Board declared the school was open. The Board was trying to manipulate the parents into supporting the strike. The Board was on TV every night claiming that there was massive anger at the union. The wonderful thing about the CTU was that even as early as 1971 we had confronted and overcome that apartheid that existed…"
Helen: A couple of years later when the teachers went on the next strike, the nurses were there. We were well organized, with telephone trees of every nurse. Wemstrom: Are we professionals or are we workers? We need the union to protect us in the workplace. Helen: If we want to be treated like professionals we can’t be doormats. Especially at the beginning it was truly a period of sacrifice. When I came to the CPS in 66 I had a baby daughter less than a year old… Getting a divorce. My husband not forthcoming with child support… I didn’t have the savings. It was really scrimping and saving. … Very very hard. I was a little bit envious of some of the teachers who could go out after picketing. Dinner was sometimes a can of baked beans with a hot dog sliced into it. Helen: I know it’s going to be a time of sacrifice now. Is it worth it? Oh, yes. You do get closer when you are in this together. That feeling of family and solidarity backing each other up, it’s not one individual fighting for himself, it’s all of us fighting for the same things. We had some substantial raises… I can remember rejoicing when the Board agreed to pay for family insurance coverage. A wonderful savings. That was when I was able to tuck aaway a few dollars for my daughters’ college education. Terry Daniels: There was the ersuading people. You would go from persuasive to sterm. During the strike we always had this little clique of people who had their eye on becoming administrators eventually. They always scabbed. Helen: How much we destested those people who scabbed. We knew they would benefit from whatever we gained. We made sure that anyone who did scab was alienated. Paul: Not a single person lost their job because of participating in the strike action. Those people we referred to as scabs, they crossed the picket line and got paid even though there were no children in the schools because the system was shut down. The scabs then received double pay because we made up all the days we were on strike. They were asked to give their ill gotten money to the CTU fund… I think it was the eyeglasses fund. Edn at Wemstrom at 18 minutes. 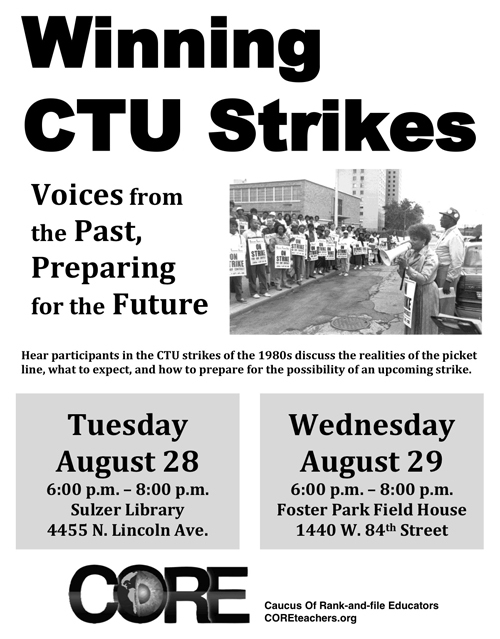 The participants in the 2012 forums and the creation of the strike video also produced a two-sided brief history of the ten CTU strikes of the 20th Century. Some official histories claim that the CTU had nine strikes, but the "FTB Strike" of 1968 was seen by most perceptive union members as a key to forging the later racial unity within the CTU that made the militant successes of the union possible. So for most union historians, the CTU has had ten strikes, not nine. A pivotal moment in the history of the CTU came during the early 1970s, when Robert Healey (above with bullhorn during the 1983 strike) and others, including leaders of the Teacher Action Caucus and the Black Caucus, formed the "United Progressive Caucus" (UPC) and successfully became the leadership of the CTU. The ability of the CTU leadership to create a powerful integrated union leadership was a key factor in the success of the union both on the picket lines and in the schools. By the time of the 1983 strike (above), Jacqueline Vaughn was Vice President of the union and former shop teacher and Black Caucus leader Glendis Hambrick was treasurer. Above, Healey is speaking with teachers on the District 3 picket line during the 1983 strike, when Ruth Love tried to play the race card against the union. Behind Healey (arms folded) is Paul Odell, who took part in the CORE-Labor Beat video in 2012.1930s. The organizations of Chicago teachers were still scattered and did not merge into the Chicago Teachers Union until 1937, but they organized major protests against the pillaging of the city’s schools during the Great Depression. When World War II began, CTU President John Fewkes took a position with the federal government, and the union became a part of the war effort. By the time the war ended, however, Chicago corruption in was so great that the entire system was almost decertified — and a wave of “reform” began. 1940s and 1950s. John Fewkes is CTU President. Martin Kennelly and Richard J. Daley Chicago’s mayor. The CTU exists without a written contract. The national offices of the American Federation of Teachers (AFT) were also located in Chicago during those years. 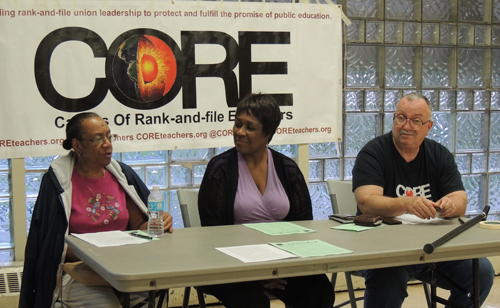 On August 29, 2012, CORE hosted the final forum on strike history at Chicago's famous Foster Park. Above, Lee White, Pat Knazze and George Schmidt recounted their experiences as striker and strike leaders during their days at Gage Park and Chicago Vocational (White), Ray School (Knazze) and Amundsen High School and other schools (Schmidt) from 1971 through 1987. Substance photo by Nate Goldbaum.1969. Two day strike. John Desmond, CTU President; James Redmond, General Supt. Of Schools; Richard J. Daley, Mayor. Strike wins a salary increase of $100 per month, employment of teacher aides, two duty-free prep periods for elementary teachers, and class size maximums of 30 – 35 (depending upon the grade). 1980. Ten day “strike.” Robert Healey, CTU President; Angeline Caruso, Interim General Supt. Of Schools; Jane Byrne, Mayor. After going without a paycheck since Christmas (“the school financial crisis of 1979”), teachers stop working for five days, then strike for five days, reducing some of the cuts forced on CPS by the School Finance Authority (which will last until 2010). 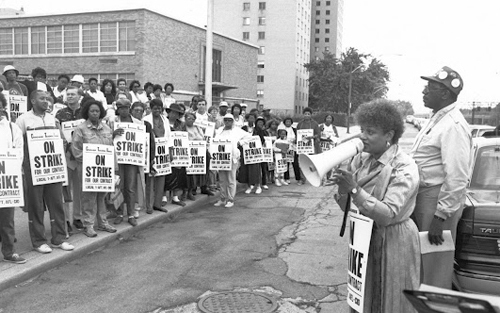 During the 19-day CTU strike in 1987, union president Jacqueline Vaughn went to the picket lines every morning and then went back to negotiations with the Board of Education for the rest of the day. Above, Mrs. Vaughn, as everyone called here, is addressing the pickets at the district office in one of the Chicago Housing Authority projects, one of the many symbols of Chicago's racism and white supremacist systems. The CTU was one of the few citywide organizations that was integrated with democratic power in the hands of all of its members, teachers and those who in those days were called "career service" (and who today are generally called PSRPs.). One of the unique things about the above photograph is that Mrs. Vaughn is shown without her trademark hat.1983. Fifteen (13?) day strike. Robert Healey, CTU President; Ruth Love, General Supt. Of Schools; Harold Washington, Mayor. The strike wins a six percent raise in the first year and three percent in the second. Improvements also include improved sick leave and maternity/paternity leaves.